NovomaticCasino.co.uk’s Inferno slot takes you right back to the basics and invokes a simpler time when slots were easier to understand and more fun to play. With Inferno, it just goes to show that you don’t need complicated paylines and fancy bonus rounds in order to get big payouts. Try it for yourself – load up Inferno, enjoy the retro vibe and wait for the cash to come rolling in. Inferno is a fantastic online slot for beginners, but also for slots aficionados who want to be transported back to a simpler time. 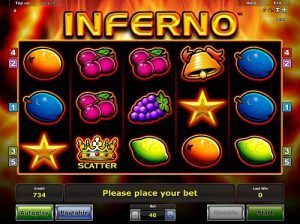 Inferno is a classic 5-reel slot with 5 paylines and some basic, yet generous, symbols. The fruit symbols include: plums, oranges, lemons and cherries, which all pay out if you line up 3 or more on an active payline from left to right, except the cherries which pay out each time you spin two or more! The golden star is the highest-paying symbol in Inferno, followed closely by the golden bell and then the bunch of juicy, purple grapes. All of these symbols will give a payout when three or more of them land on an active payline in successive reels, from the far-left to the right. The biggest payouts come when you spin 5 or more in a row across the reels! The Scatter symbol in Inferno is a golden, bejewelled crown and this pays when three or more land on the reels – and it pays wherever they land! The minimum bet for Inferno is 0.40 and, like most other NovomaticCasino.co.uk’s games, you can play for free until you get the hang of it and you’re ready to play with and win real money! Your balance is clearly shown at all times on the bottom left of your screen, and your last win will always be on the bottom right. You can change your bet at any time using the plus and minus symbols, and if you want to see how much each symbol pays out according to your current bet, you can always consult the paytable. Once you think you are happy with your bet and feel like you don’t need to keep clicking, you can choose to put the game in ‘autoplay’ mode where the game will spin the reels for you automatically. When playing with ‘autoplay’ however, you won’t be able to use the game’s gamble feature – which you can use every time to get a win while you’re playing manually. If you’re feeling lucky and you want to heat up the game, you can choose to gamble your last win. All you have to do is have the courage to click ‘gamble’ instead of ‘collect’ and correctly guess whether the following card is going to be red or black – get it right and you’ll double your win, but get it wrong and you’ll be back at the reels without your win. For players who enjoy going back to basics, or for anyone who’s new to slots and has enjoyed Inferno, why not check out our other retro, fruity slots such as: Fruits’ n Royals. If you’ve enjoyed Infero and you’re looking for something a little more advanced and elaborate, why not check out other NovomaticCasino.co.uk games such as: Power Stars slot or Plenty on Twenty. NovomaticCasino.co.uk also offers some fantastic online table games, such as: Sic Bo, Royal Crown 3 Card Brag, Royal Crown Blackjack and Multiball Roulette. What’s more, NovomaticCasino.co.uk has live casino games, which you can play from the comfort of your own home. You can join in with a game of Live Baccarat, Live Blackjack, Live Roulette or Live Poker from your living room! Sitting on the sofa will feel as if you’re sitting at a table, right on the casino floor, amidst all the action, glitz and glamour of real casino.